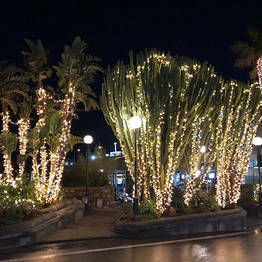 Capri island at Christmas is particularly magical. Blue fairy lights line the port and the lanes in the center of town, and the islanders brave the bracing sea wind to admire the shop windows and share a drink with neighbors under the heat lamps at the outdoor cafes. There are a number of events held from the beginning of December through the first week of January, including the Capri Hollywood film festival (26 Dec - 2 Jan) featuring previews of new releases and gala evenings. 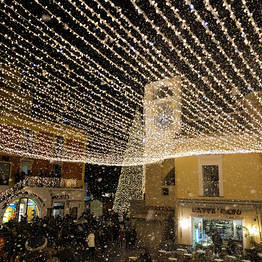 The main holiday event on Capri is New Year's Eve in the Piazzetta. 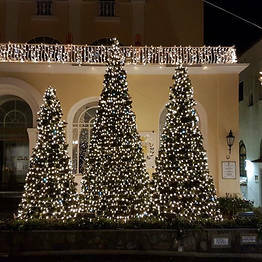 Island tradition is to ring in the New Year together in the main Piazzetta square, where everyone gathers to await the stroke of midnight. Each year, a stage is set up where live bands play until it's time to toast to the New Year. After midnight, the Piazzetta becomes an open air disco with music and dancing until dawn. Otherwise, festivities can also continue indoors in nearby clubs like "Anema e Core". 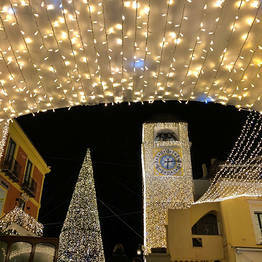 The following restaurants offer a special New Year's Eve dinner: Al Caprì, E' Divino, Michel'angelo, Verginiello, Villa Jovis, and Villa Verde. The chairlift and the Blue Grotto are closed on 25 December and 1 January. They are both open all other days, weather permitting. During winter holidays buses and funicular will follow a reduced schedule. Between Christmas and New Year’s, ferry routes from Naples and Sorrento to Capri will run according to the following schedule. Ferries will run according to the published schedule aside from the high-speed ferry/hydrofoil Naples-Capri at 7:15PM. The only ferries routes Naples/Sorrento-Capri and vice versa running are those provided by Caremar. Ferries will run according to the published schedule aside from the high-speed ferry/hydrofoil Naples-Capri at 6:50AM. Ferries will run according to the published schedule. CAPRI-NAPLES: Ferries will run according to the published schedule aside from the ferry at 5:40PM. SORRENTO-CAPRI and vice versa: ferries will run according to the published schedule. Caremar ferries will run according to the published schedule. NAPLES-CAPRI: 7:00AM - 9:30AM - 11:35AM - 2:40PM. CAPRI-NAPLES: 8:05AM - 10:35AM - 12:40PM - 4:30PM. Ferry schedules for 1 January may change at the last minute. Ferries will run according to the published schedule aside from the high-speed ferry/hydrofoil Capri-Naples at 6:50AM.